Tottenham enjoyed a comfortable win, against a team that has troubled them little since returning to the Premiere League, coming out away to Swansea as 3-1 winners. This leaves Spurs heading into a ten day break having taken 16 of 18 points under Tim Sherwood in the league and well in the fight for a Champions League position. The three points takes on added importance as Spurs play Manchester City, Everton and Newcastle after their break and have a tricky away match to Hull City(Tigers) in the mix too. Not an easy run of fixtures. It was also nice to grab a win before a break, something Spurs failed to do in matches ahead of international breaks earlier in the season. The two biggest stories from the match from a Tottenham point of view, was Sherwood finally showing some tactical depth and changing the formation and another excellent display from Adebayor. The most interesting subplot of the match was the similar play from Swansea’s lone front man, Wilfred Bony, and Spurs’ lone forward, Adebayor. Both were superb throughout and displayed an ability to play multiple center forward roles by themselves through excellent work rates and positioning. We will get back to that later in the week. First, the formation change was a welcome sight to many Spurs fans, particularly this one, as Swansea are the type of side that can exploit two man central midfield pairings very well. It is a big part of what got them to the Premiere League in the first place. They play a high possession game based around a 4-2-3-1/4-3-3 formation with their three man midfield crucial to their ability to retain possession and pose threats in the final third. Tottenham easily switched from a 4-1-4-1 defensive block to more of a 4-4-1-1/4-2-3-1 buildup shape. The switch simply involved Eriksen stepping forward to operate behind Adebayor and Bentaleb stepping forward to come alongside Dembele in the initial buildup phase. That’s very simply 4-4-1-1 and then we would see Lennon push on, Dembele get further forward, the fullbacks push up and then we reach the point of it being pointless to classify the “formation” in the final third, the defensive block and initial buildup shape is what is important. The switch involved Eriksen doing what he has already been doing, drifting around where he pleases in between the lines, the difference, a big one, is that when he did so against Swans he had much less distance to cover to get from his defensive zone to where he wanted to operate and then back into the defensive block. This allowed him to have a large influence for Spurs in possession but also was able to do a job in the defensive phase. His role out wide at left mid was covered by Nacer Chadli, who had an extremely quiet game, he had no shots on goal, created one chance and didn’t make a tackle or intercept a pass. However, his constant presence in that wide position helped to force Swansea to play through the middle, as Lennon, as usual, did the same job on the right, he kept his width in all phases of play. Swansea had little ability to spread Spurs out or create overlaps with their fullbacks or play balls into Bony from wide positions. They were forced into the middle, where Spurs had even numbers and an ability for the wide players to then pinch in and tighten up the defense even more. The defensive setup wasn’t perfect, however, as Spurs did cause themselves a few problems. One glaring issue was not due to the tactical setup, but to Danny Rose’s poor decision making about when to step out from the backline. On a few occasions he stepped out needlessly and created space in behind that Spurs were lucky not to be exploited on. The picture below is just such an instance, what could happen, as mentioned in the photo, is exactly what does happen, Jonjo Shelvey receives a layoff and plays a through ball out wide right into the space vacated by Rose. Luckily, for Spurs, Jonjo over hits the pass and Spurs don’t suffer from it, but it’s an example of Rose sometimes being too eager. Which is not a bad thing, if it can be coached and he can become more disciplined in the defensive phase. Swansea also at times found it easy to slip a pass to Bony or Shelvey operating in between the lines. They were able to drift away from the backline, for Bony, or beyond and away from Spurs midfield, for Shelvey, and both were able to get off a host of shots from range. Bony was the more accurate of the two, by far, but it’s still a concern. Bentaleb seemed to handle his role better as the game went on, staying tight to Shelvey when he drifted in between Spurs lines, but a 4-1-4-1 shape cries out for Capoue or, preferably, the master of destruction himself, Sandro. Again, Spurs weren’t burned by this here and Bony didn’t get his goal until Spurs were comfortably ahead. Bony did force a save and hit the woodwork from two of his three shots from outside the box. But we’re also talking about a struggling side in Swansea, a better side may have snatched their chances better, before Spurs adapted. The best benefit from fielding Bentaleb behind a central pairing was an added ability to slow down and breakup counter attacks, which allows the fullbacks more comfort in pushing forward. The second goal was an own goal but it was created from a cross near the byline from Kyle Walker on a pass from Dawson stepping forward. The exact type of play we can see more often with added cover. Walker and Rose get flack from time to time for their forward runs, but that is part of the modern fullback’s expected abilities. The problem lied in their lack of cover, not their willingness to get forward. Below, in a poor screenshot, we see Swansea on a three man break, that is matched by three Spurs covering in goal side positions and Walker trailing the play. Spurs resolve this situation and Swans are unable to create a chance from the break involving Bony and Shelvey, their most dangerous players on the day. Spurs won back possession around the midfield areas, mostly inside their own half, they were neither sitting deep, nor looking to press high, they set the defensive block around the center line and, again, forced Swansea to play narrow, away from Spurs’ box. 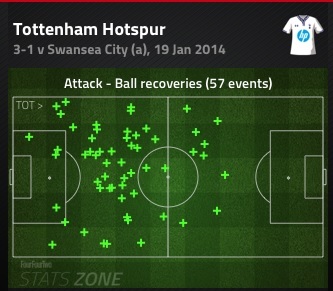 Tottenham did an excellent job of letting Swansea have more possession but not much in threatening areas. 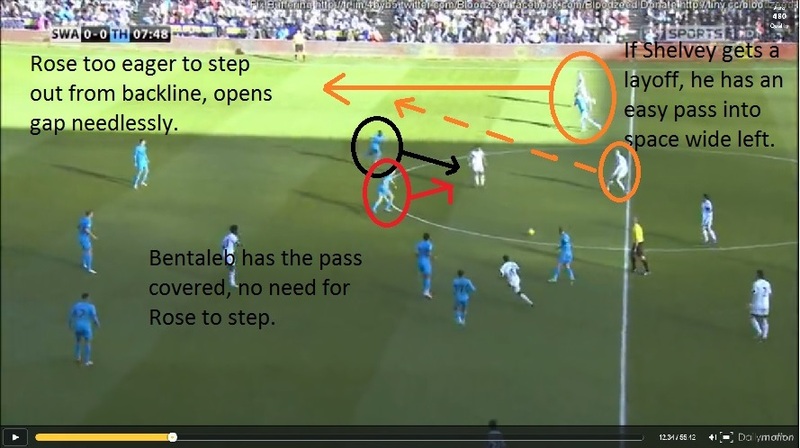 The defensive block included Lennon and Chadli wide and Adebayor up top, three easy outlets for Spurs to pass to when possession was won back, the defensive shape lent itself to an immediate ability to spread the ball when getting the ball back. As mentioned, Chadli had a quiet game, but unlike when Eriksen plays wide left, he kept his position out wide when Spurs had possession. It had a two fold effect of allowing him to fulfill his defensive duties, while at the same time supplying an ability to stretch the play when Spurs were in possession. It’s not a glamorous job, but Dembele, Lennon and Eriksen provided enough creativity from midfield that it’s really all Chadli needed to do. And he did. The high points of the match are surely, Eriksen and Adebayor’s excellent play, Spurs overall attack play flowing smoothly with only one striker and Walker and Rose contributing to two of three goals from fullback positions. That will surely be written about and talked about a great deal among Spurs supporters and Spurs blogs over the coming days, but all of the above is also important to look at and take note of. And credit needs to be given to Sherwood for showing he may not be as tactically naive as some(including myself) thought him to be. He might only be a Harry 1.5 and not a full blown tactically blind clone. Did he switch the system because of Swansea’s style? It’s possible, it’s still possible to cynically say he only did so because Soldado has been poor and Adebayor is doing the work of two strikers by himself. But, either way, he has now had two clear cut chances to adapt his tactics and the first time he needed to do so in the league, he did. The real tests will come against Manchester City and Everton’s outstanding attack forces, City with their utterly stupid ability to score goals and Everton with their brilliant manager, Roberto Martinez, playing some of the best possession football in England. There is still no revolution taking place at White Hart Lane but Sherwood is getting results, Spurs are an attractive side once again and we’ve seen the break from 4-4-2 we all wanted. And for now, there really isn’t much to complain about, the mighty Spurs are marching on in style once again.